Financials sector is one of the best performing sectors on the US stock market. This post focuses specifically on Property & Casualty Insurance industry. While there were doubts in late 2016 about the industry trend due to several reasons like unseen Trump administration, an increase of cyber-attacks, etc.., none of that has actually negatively impacted the healthy companies’ balance sheets. In contrast, the increasing home and small trucks sales have had a positive impact on stocks focused on these segments. 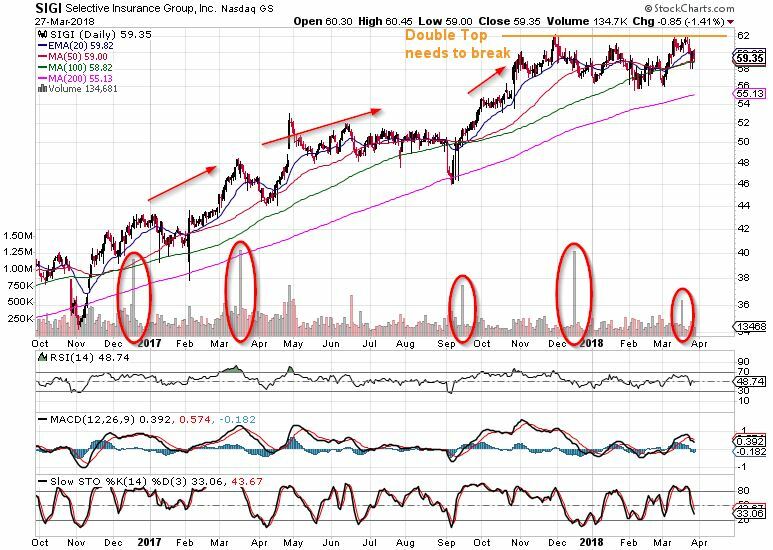 There are one big and one medium cap stocks that play well a trend following game these days: The Progressive Corporation and Selective Insurance Group. The company provides insurance products for automobiles and trucks in a motor related segment, and for home and property owners in property segment. The last four reported earnings: first two slightly missed the estimates, while recent two have beaten the estimates. The revenue has been significantly rising on annual basis. The Progressive Corporation has been on a bull race for 10 years nicely following its bull trend channel. During a recent year, the stock has been constantly bouncing from its 20 EMA and two times it tested its 100 SMA. Its support level is depicted by an orange dashed line around 57. 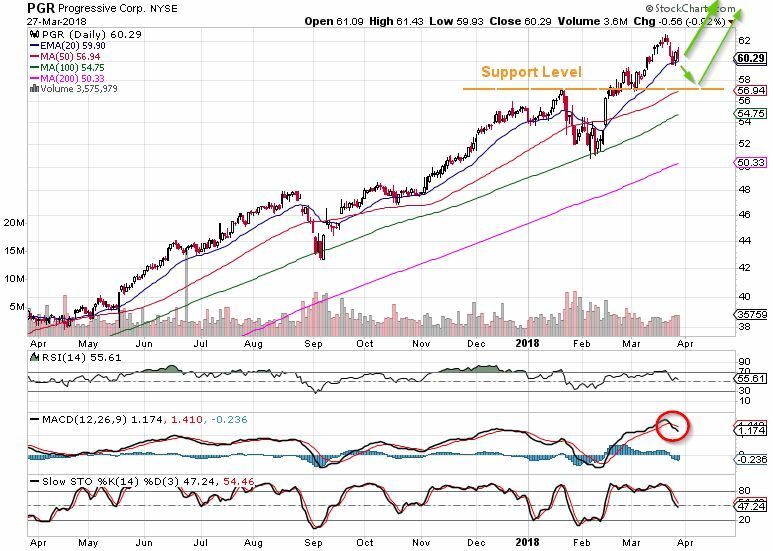 Since we are experiencing higher volatility in current market consolidation, the progressive corporation stock may test its support before it continues rising again. It is also indicated by MACD crossing down the signal line (red circle). Selective Insurance Group is a holding company focused on property and casualty insurance services. From last four reported earnings, only 2Q 2017 slightly missed the estimate, while the remaining three have beaten the estimates. The revenue has been significantly rising on annual basis. The company is on a three-year bull run. The increased volume (red circles) is spectacularly showing how share price rose each time. The most recent volume increases in December 2017 and now in March still miss their share price escalation. This is due to recent consolidation and double top pattern formation. If the pattern completes successfully the stock price goes down and loses its trend. However, the fundamentals behind are too positive for the bear market. Once the double top is broken and the stock goes above 62, an entry opportunity is available for successful continuation of trend following. Both companies offer great investing opportunities. Important is to stay disciplined and focused on the big picture!